This buried treasure cake was an eight inch vanilla cake with vanilla buttercream icing. It was made for a pirate theme birthday party that was around Halloween. All of the accents were made out of fondant and gumpaste. 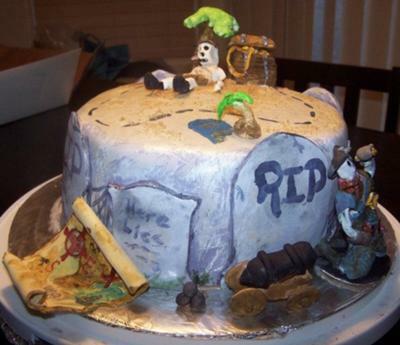 The fondant tombstones that go all the way around the cake were made using cookie cutters and them were hand painted with gel food colors. There is a treasure map hand painted on the top with a little brown sugar sprinkled over it to act as sand, and give a little texture. I think the treasure map turned out to be my favorite piece to make. I cut out a piece of gumpaste in the shape of a rectangle and rolled the edges; after it had dried a bit I "stained" it with diluted food coloring, then hand painted the details. There was also a gumpaste canon and cannon balls that I added to the bottom and little palm trees and a treasure chest for the top of the cake. All of the details were made in advance and I let them dry a couple of days before making the rest of the cake. The trickiest parts were the figures, and they could have used a little improvement, but lucky for me- they are skeletons and are supposed to look a little beaten up. Return to February 2012 Cake Decorating Contest Submission Form.